Now that June is here, I thought this now would be a great time to take stock of my progress towards my 2016 Reading Goals. As a reminder, here are the goals I set for myself earlier this year. 1. 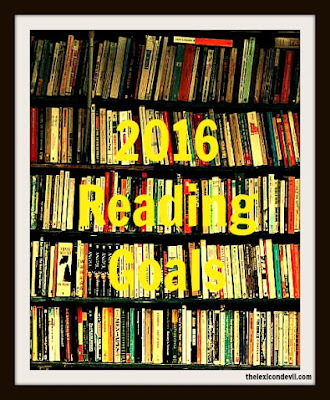 I have read 35 books towards my 100 book goal. I am about 5 books off-pace at the moment. 2. I have read 4 of my 10 audiobooks; however, I have not listened to an audiobook in several months. 3. I have read 4 of my 10 ebooks; I currently have several ebooks that I need to read for review in the very near future. 4. I am about halfway through the Death Note series. There are thirteen books in the series and I have currently read volumes 1-6. 5. I have yet to complete a YA series. However, I have started Cinder, the first book in The Lunar Chronicles and I own Scarlet, the second book in the series. I also own The Red Queen, the first book in the series of the same name. The other day, I also bought a copy of Clockwork Angel, the first book in The Infernal Devices series. So, while I have lots to choose from, I have yet to follow through on reading a YA series yet. Perhaps the summer doldrums will be the right time to get stuck in. 6. I haven’t read with my new rescue pups yet; however, I just picked up a stack of picture books from the library to share with the little fur babies. 7. I haven’t read a series of novels yet, but I am thinking I might either read Margaret Atwood’s Madadam trilogy or complete the Liveship Traders Trilogy by Robin Hobb since I own the first book in the series, Ship of Magic. 8. I would say that I am doing relatively well in my quest to read more diversely. To date, I have read nine books that are either by an LGBTQIA or non-white author. One of my reads, Howl and Other Poems by Allen Ginsberg, was by a gay white American man; another was by an African-American women, Brown Girl Dreaming by Jacqueline Woodson; one book was by a Korean woman, The Vegetarian by Han Kang; one book by a Canadian-American woman of Japanese descent, A Tale for the Time Being by Ruth Ozeki; and five books by Japanese Men, Volumes 3-6 of Death Note by Tsugumi Ohba and then Colorless Tsukuru Tazaki and His Years of Pilgrimage by Haruki Murakami. While I am happy with my progress overall, I want to continue to read more diverse literature and get back into the habit of listening to audiobooks again. With five months under my belt for 2016, and a whole summer ahead of me, I am pretty pleased with how I have done so far. Here’s to the next seven months!